This most interesting surname may have derived from either of two origins. Firstly, it may be of locational origin, from either Corbon in Calvados or Corbon in Orne, in France. Hence the name may have arrived in England after the Norman Conquest of 1066. The surname may also have derived as a nickname for a man with strikingly glossy black hair or for one with a raucous voice, from the Middle English or the Old French "Corbin" Corbun", raven. 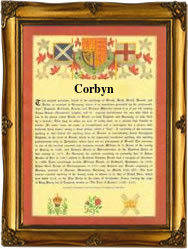 The personal name was recorded as "Corbin(us)" in the Domesday Book of 1086 in Warwickshire and Kent. The surname itself is first recorded in the late 11th Century (see below). Hugo de Corbun was mentioned in the Domesday Book of Norfolk and Suffolk. One Roger Corbin was listed in the Assize Court Rolls of Somerset in 1201, while Walter Corbyn is recorded in the Assize Court Rolls of Yorkshire in 1219. A Coat of Arms was granted to a Corbin family in Guernsey, which depicts three black ravens on a gold chief, with a silver shield or three ravens proper on an engraved chief, with a red and blue shield. The family motto is "Deus pascit corvos", God feeds the ravens. The first recorded spelling of the family name is shown to be that of William Corbun, which was dated 1086, in the "Domesday Book of Essex", during the reign of King William 1, "William the Conqueror", 1066 - 1087. Surnames became necessary when governments introduced personal taxation. In England this was known as Poll Tax. Throughout the centuries, surnames in every country have continued to "develop" often leading to astonishing variants of the original spelling.